And while we’re all waiting for the US release of Monster Hunter Tri, Capcom decided to make us fans drool even more with a press release confirming the next Monster Hunter PSP game due out THIS 2010. YAY! Capcom Co., Ltd. (Capcom) is pleased to announce the release of “Monster Hunter Freedom 3” for the Sony PSP® (PlayStation®Portable), set for Late 2010. “Monster Hunter Freedom 3” is a hunting action game that puts the player in the boots of a fearless hunter tracking down and fighting ferocious monsters in a breathtaking natural expanse. 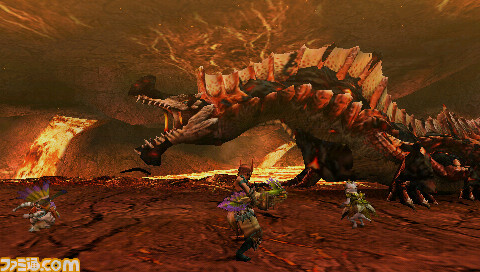 The distinctive and groundbreaking cooperative game play style of the “Monster Hunter” franchise, which lets friends work together to bring down huge, fearsome monsters as a team has fostered a new level of communication and interactivity in video games, and has spawned the social phenomenon known as the “Monster Hunter Craze”. 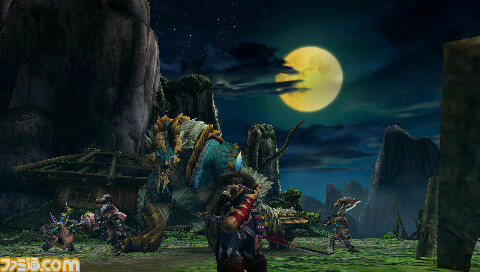 As well as recently being awarded the Minister of Economy, Trade and Industry Prize, an award that commends the people who created it, and receiving a Special Award in the games of the year division at the Japan Game Awards: 2009, Monster Hunter won the highest award and accolades at the CEDEC AWARDS. The latest addition to the “Monster Hunter” series, “Monster Hunter Freedom 3”, adds new elements of communication while enhancing the feel and beloved game play of the series. With the introduction of brand new regions and monsters to the series, an improved Felyne Comrade System, and having polished the cooperative play system that makes playing “Monster Hunter” on the PSP® so much fun, the game’s content will not only satisfy players who are already fans of the series, but new users as well. Also, beginning on March 13th, 2010 for about one month, fans will be able to visit the “Monster Hunter World” exposition at the Greenland theme park in Kumamoto Prefecture and be immersed in the world of “Monster Hunter”. There will be Monster Hunter-themed attractions and “Monster Hunter” merchandise on display. We plan to hold even more events like “Monster Hunter World” going forward. At Capcom it is our continued goal to bring our properties to multiple platforms to provide the best entertainment experiences, and the “Monster Hunter” series is no exception to this. We hope to continue meeting and exceeding the expectations of gamers with our dedication to develop exciting titles for the best gaming platforms available. So what’s new with Monster Hunter Portable 3rd? As said above, the game will be available in June this year which is awesome 😀 Thanks for the birthday gift Capcom. yep but about after a year or so from the japanese release. Thanks 4 d information dude! in june its my B-day 2! Are all of u American???? All of my Siblings And cousins play MHU!! can there be at least 2 felynes who follow U all the time? And u can cuztomize their armour? If it is that would be really cool 4 me. And When is the confirmed release date for MH3P? Yep, you can take up to 2 felynes. But they won’t be available when you’re playing with other people (multiplayer mode). Monster Hunter P2g and Freedom Unite offered VERY limited customizations to the felyne companion’s armor. Capcom states it will change with Portable 3rd. Whoa! ur online Can u Answer my Question?? Awesome I can play this in 2012 when the NA version comes out…. there a demo now out sylv3rblade!! but i cant find a download link plus they say that some have already patch the demo to english 75% at the very least! maybe you could please give us a link?